A delegation linked to our work in Kenya recently visited Melbourne. 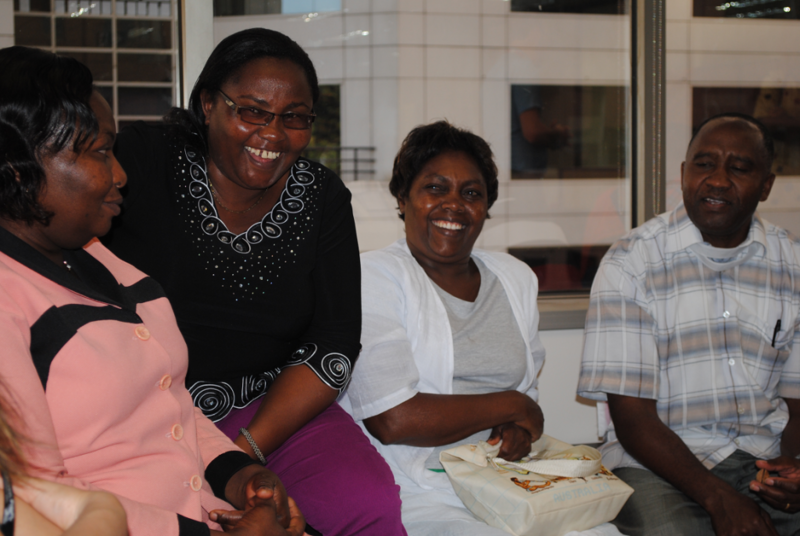 They included people from our partner, the Anglican Church of Kenya, as well as from the Kenyan Ministry of Health. We also took the opportunity to enable the visitors to attend St Jude’s Anglican Church in Carlton. Nils von Kalm spoke to one of the visitors, James Sandura, Project Officer for the Anglican Church of Kenya (ACK), Diocese of Mount Kenya West. James Sandura approaches me wearing a blanket whose colours represent the community he comes from in Laikipia County in Kenya. He is a Project Officer with the Imarisha Building Safer Communities project there. He has been working with the ACK since 2011, when he was part of a large maternal and child health project, supported by the Australian Government, from which the Imarisha project has emerged. The project reflects a significant partnership between the ACK and the local Ministry of Health in the way that maternal and child health develops in the region, and it has also incorporated our work on gender-based violence (GBV). The project seeks to build safer communities, by addressing the link between poverty and violence against women and children. Through the project, the ACK also aims to equip people with skills to provide for themselves and lift themselves out of poverty. It has established community gardens and is helping farmers introduce new methods to improve sustainability and productivity, particularly in a changing climate. Farmers are also learning about how to increase their income from farming. James has been involved in all of this work, and is visiting Australia with several of his colleagues from the ACK as well as some from the Ministry of Health to receive training as part of the Australian Government’s Australian Award Fellowship. The Nossal Institute for Global Health and Anglican Overseas Aid have been awarded this Fellowship as a grant to train the Kenyans. Part of James’ role in the project is to talk to men about the importance of assisting their wives to access health services. He also trains Community Health Workers, volunteers who are trained to reach the community with health messages. Using a strengths-based approach has enabled the community to realise that they have good ideas and that they can also bring these ideas to the government. When the local governor visited the community recently, they told him about their need to have more water tanks in the area. The Church’s strong relationship with the Ministry of Health is helpful in encouraging women giving birth to attend a health facility. This is much safer than giving birth in their own home. Traditional homes, called manyattas, have now been built alongside the Ministry of Health facilities. Women can stay in the manyatta before and after the birth. This helps their experience to be as ‘home-like’ as possible. The manyattas have cooking facilities, a bed for a helper to stay, and added warmth for the cold weather. The success of this approach has been remarkable. The number of women giving birth in these health facilities has increased from 10 percent to about 40 percent since the project began in 2011. One of the benefits of having someone like James working for the Church in this area is that he is a local. He was born and raised in Laikipia County and knows the conditions in which people live there. As a result, he has been able to develop a good rapport with the people in the communities. As I finish the interview with James, he expresses his immense thanks for the support that Anglicans in Australia have provided for the Imarisha and previous projects. As he gets up and wraps his blanket around him again, James smiles and shakes my hand. It is a privilege to have such a connection with our brothers and sisters from distant places. Although we are far apart geographically, we are united in the cause of bringing increased access to health to communities who need it. It is a privilege we are both thankful for. Sign up to eBundance, our monthly enewsletter, today and we’ll keep you up to date with our latest news and events. © 2019 Anglican Overseas Aid ABN 39 116 072 050 | All donations of $2 and above are fully tax deductible in Australia. Anglican Overseas Aid is fully accredited with the Australian Government’s Department of Foreign Affairs and Trade, which makes us a trusted recipient of funds from the Australian Government’s aid budget.